For years, scientists believed the vast phenotypic differences between humans and chimpanzees would be easily explained  the two species must have significantly different genetic makeups. However, when their genomes were later sequenced, researchers were surprised to learn that the DNA sequences of human and chimpanzee genes are nearly identical. What then is responsible for the many morphological and behavioral differences between the two species? Researchers at the Georgia Institute of Technology have now determined that the insertion and deletion of large pieces of DNA near genes are highly variable between humans and chimpanzees and may account for major differences between the two species. The research team lead by Georgia Tech Professor of Biology John McDonald has verified that while the DNA sequence of genes between humans and chimpanzees is nearly identical, there are large genomic "gaps" in areas adjacent to genes that can affect the extent to which genes are "turned on" and "turned off." The research shows that these genomic "gaps" between the two species are predominantly due to the insertion or deletion (INDEL) of viral-like sequences called retrotransposons that are known to comprise about half of the genomes of both species. The findings are reported in the most recent issue of the online, open-access journal Mobile DNA. "These genetic gaps have primarily been caused by the activity of retroviral-like transposable element sequences," said McDonald. "Transposable elements were once considered 'junk DNA' with little or no function. Now it appears that they may be one of the major reasons why we are so different from chimpanzees." McDonald's research team, comprised of graduate students Nalini Polavarapu, Gaurav Arora and Vinay Mittal, examined the genomic gaps in both species and determined that they are significantly correlated with differences in gene expression reported previously by researchers at the Max Plank Institute for Evolutionary Anthropology in Germany. "Our findings are generally consistent with the notion that the morphological and behavioral differences between humans and chimpanzees are predominately due to differences in the regulation of genes rather than to differences in the sequence of the genes themselves," said McDonald. 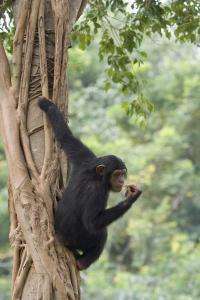 The current analysis of the genetic differences between humans and chimpanzees was motivated by the group's previously published findings (2009) that the higher propensity for cancer in humans vs. chimpanzees may have been a by-product of selection for increased brain size in humans. Do you want fries with that, Mickey? Cancer: The cost of being smarter than chimps? People really ran with the " junk DNA " name for a while. Phew, glad it's over, I'm about as tired of hearing that moniker as I am " god particle ". ..or like the "Big Bang" moniker, which switched its role once already. The science is about evolution and switching of its paradigms, in circles or spirals often ..
'Junk DNA' is a misnomer. All of it has a purpose from the very beginning of our lives to the very end. We are only beginning to understand how it all works and at what times of life the different genes contribute. Does it mean that we can take a chimp and express the right genes to make it human? About time we quit calling our genetics 'junk'. So with the epigenetic research confirming our DNA is being manipulated by the free radicals which are so abundant in our lives due to genetically modified foods, chemicals and pollution we're changing the human race into,..? Hello...like everyone else, I protest the prolonged use of the term "junk DNA", which was a tongue in cheek term used by Susumu Ohno in 1972. It turns out that ~ 90% of the DNA is transcribed. Non-coding RNAs have important role in cancer, disease, gene regulation. Now for this article, it is absolutely a re-invention of the wheel. My professor at Berkely, Alan Wilson published this idea in 1975 (Science 188-107). @ Lala..your understanding of epigenetics is somewhat weak. Free radicals are not involved, nor are they part of genetically modified foods. Free radicals live less than 1/100,000 of a second. Free radicals are continuously generated in our bodies through oxidative phosphorylation. There are > one million free radical induced damage sites/DNA every day- we have very efficient mechanisms to repair this damage. So the changes in the human race are greed, not DNA.